To kick-off our SKA People initiative, we co-organised with the Jodrell Bank Discovery Centre this year’s “Girls Night Out” on the 20th of June 2015. This event has grown in size and in interest every year, with the aim of engaging and interesting girls of all ages into the field of science, specifically astronomy, space science, engineering and ICT. This year’s guest speaker was SKA’s Roshene McCool, Domain Specialist, who opened the event in front of around 120 attendees with an inspiring talk about her journey into a STEM field, and all the challenges that came with it. Roshene also talked about the SKA and its future, and the possible career paths that can be taken in order to work for a world-class facility. 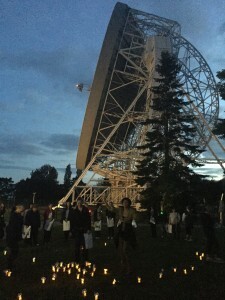 The event itself consisted of stimulating activities from SKA dish cutouts, soldering LED badges, to finishing with a mini-array created using the dish cutouts. During these activities, 5 female staff from SKAO volunteered their time to interact and share their stories with the public who attended; they also got to enjoy some SKA themed refreshments with everyone else! Many thanks to Maria Grazia Labate, Xiaoxuan Zhu, Angela Gao, Anna Scaife and Giulia Marsili for their help. 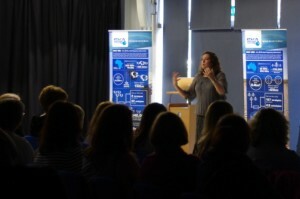 The event received outstanding positive feedback from all who attended, most of whom saying they felt inspired and wanting to engage more with STEM subjects. You can read Teresa Anderson’s excellent blogpost on the event.